Tours begin Friday, May 24th. Please select a date on or after May 24th. The Oconaluftee Farm tour of the Smoky Mountains has a little something for everyone—making the most of quality time with loved ones in the great outdoors. This tour offers a paved experience and a thrilling 4x4 off-road adventure toward the end of your Oconaluftee Farm experience. From our Pigeon Forge location, you’ll head for North Carolina. From the start, you’ll begin to fill your senses as you ride in an iconic, open-air Pink® Jeep® Wrangler. You’ll hear of the Native American cultures, pioneers and farmers. Soon, the Jeep stops at Oconaluftee Farm. This outdoor museum features a collection of 19th-century buildings that include a farmhouse, barn, apple house and blacksmith shop. Situated next to a beautiful rolling stream, the site gives you a look into how families may have lived. Have your camera ready; this picturesque location often hosts grazing wildlife. From Oconoluftee, you’ll climb 3,000 feet on paved roads. You’ll pass through a mixed forest made up of trees and smells that mimic that of the boreal forests that form a ring just south of the Arctic Circle. 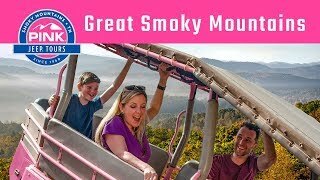 You’ll discover how the Smokies got their name, stop for amazing photo opportunities and hear more of local geology and history. You’ll arrive at Newfound Gap, which is nearly 1 mile above sea level. You’ll see part of the mighty Appalachian Trail. Rockefeller Memorial, where U.S. President Franklin D. Roosevelt stood to dedicate the Great Smoky Mountains National Park on Sept. 2, 1940, is here. But Newfound Gap’s main attraction is its stunning viewpoint. It stretches as far as your imagination no matter the season. April and May bring wildflowers. The summer brings rolling and layered green hues. The fall features vibrant autumn colors. And, the winter reveals the true scale of the Great Smoky Mountains after its leaves have fallen. The return trip includes stops for more photos. You’ll see the streams that ultimately feed the Gulf of Mexico via the mighty Mississippi River. Your tour finishes with a thrilling off-roading ride through a trail on private land. Your professional tour guide has been expertly trained to give you an experience unlike any other in the Great Smoky Mountains.